The New York Times is the newspaper President Trump both loves and hates the most. He has called The Times both a "great, great American jewel" and "fake news." He has courted Times reporters and ridiculed them on Twitter. He has promoted the paper's reporting when it helps him and threatened the paper when it hurts him. Now he's attacking the paper for publishing an anonymous op-ed from an unnamed senior official in the administration. On Friday, he called it "disgraceful." In the wake of the op-ed, The Times is receiving more than the usual number of angry calls and emails from members of the public. It has stepped up security at its offices "given the heightened nature of the attention we are receiving right now," according to an internal memo on Friday. The Times, of course, was just the messenger. The chilling message from the government official -- about a secret "resistance" out to protect the US from the president -- is what really matters. The op-ed was published on Wednesday afternoon. As of Friday morning, it has clocked 12 million page views, making it "one of the most read pieces of 2018" on the Times website, according to a spokeswoman. Times op-ed editor Jim Dao said he underestimated the power of the piece. "We didn't realize it would be this big of an impact," Dao said on The Daily podcast. On Friday afternoon the op-ed was still the most-read and the most-emailed article on the site, and it was the most-shared Times article on Facebook. All the attention has come with severe anger from Trump and his allies. On Friday, he called on Attorney General Jeff Sessions to ferret out the source. The Times responded in a forceful statement. "We're confident that the Department of Justice understands that the First Amendment protects all American citizens and that it would not participate in such a blatant abuse of government power," the paper said. Trump also lobbed another empty threat at the Times. When he was asked by a reporter if he'll take unspecified "action" against the paper, he said "we'll see." If history is any guide, nothing will come of that comment. Trump has threatened to sue The Times in the past, but never has, likely ceding to the advice of his counsel that any suit would be thrown out of court. 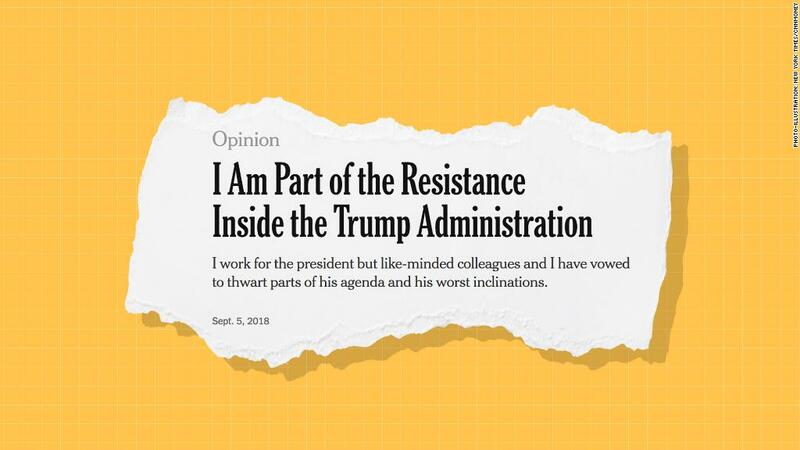 The Times said Friday that "the president's threats both underscore why we must safeguard the identity of the writer of this op-ed and serve as a reminder of the importance of a free and independent press to American democracy." Trump has a twisted relationship with The Times. He's been reading the hometown paper for decades. When he visited the paper's headquarters after winning the election in 2016, he called the Times a "jewel." Outside analysts and some of the Times' own reporters have said that Trump covets the paper's attention and approval. "When Trump talks to his friends, he continues to marvel that before he was campaigning and then POTUS, he was on the front page of NYT only a handful of times, but that he's on it constantly since then," Maggie Haberman tweeted last month. Haberman and other Times journalists have interviewed Trump on numerous occasions since election day. But his attitude varies depending on the day or the story. He has also trashed Haberman as a "fake reporter" who "I don't speak to and have nothing to do with." He has used his bully pulpit to blast the paper as "failing" (it's not) and unfair to his administration. Trump had a private meeting with publisher A.G. Sulzberger over the summer. He said it was "very good and interesting." The paper later said that Trump was the one who sought the meeting. But the president has also called the Times "failing" or "phony" or "corrupt" dozens of times. On Thursday, press secretary Sarah Sanders went with "failing" in a fiery statement that discouraged speculation about the op-ed writer and encouraged people to call the Times to complain about its choice to publish the piece. Sanders' message printed the Times' main phone number and told people to ask for the "opinion desk," but the automated phone system was flummoxed by the calls. The system transferred people in all sorts of directions -- to random reporters and ad sales representatives and others. "We've seen a substantial uptick in incoming calls," Friday's internal memo confirmed. Some Times reporters said on Twitter that they received hateful calls interspersed with surprising "thank you's" from callers who wanted to stick it to Sanders. "I'm not calling to complain. I'm calling to tell you guys, keep up the good work," one caller said in a voicemail to reporter Dan Barry. "Don't let what's going on in the White House and all their negativity affect you guys. I for one appreciate everything you're doing," the caller said. Friday's internal memo recommended to staffers that "if you don't recognize the number of an incoming call, let it go to voice mail." And "if you find yourself on the line, obviously be courteous, and you can direct the caller to nytimes.com/readers to send feedback." CNNMoney's Oliver Darcy contributed reporting.